Wonderful. Bottles and caps. Homebrewing? Or making molotov cocktails? We have some serious crazy going on in Chicago this weekend. I'm staying home. Being in the Chicago area, a friend called me this morning to alert me to the story and to caution that I may be next! Thankfully, I am out of town Saturday, but I am brewing Sunday regardless! I am reminded of the quote from the late Mayor Richard J. Daley, who said during the 1968 riots at the Democratic National Convention: "the police aren't there to create disorder, they are there to maintain it." And this surprises you? It's Chicago. 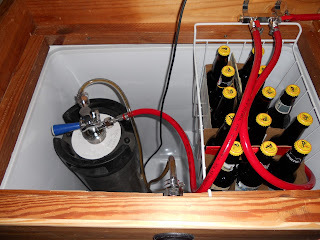 I will be brewing beer on Saturday morning, which will explain the brewing equipment. Do not be alarmed as there will also be bottles, caps, and capping equipment on the premises....however, I expect that we will be removing more alcohol (in the form of beer) from bottles on this day than we put into them. If you stop by, you are welcome to sample some, no warrant necessary. However, since this is home brewed beer, a combination of federal, state, and local law along with established tasting room norms and practices prohibits me from allowing you to remove any beer or equipment from my brewery without my express consent or that of a judge. You may only obtain my consent based on your behaviour and only if you bring your own container....I can't vouch for the judge, but bring him along too. As I am going out to the garage with bottles and caps to package beers from the Keezer I look over and see the mower and gas can. Look down the drive, no police in sight. RDWHAHB. I just took the deposit cans and bottles out to the garage. Let's see, 10 empty wine bottles. 5 gallons of gasoline. A bag of old t-shirts I use as grease rags. One butane grill lighter. On top of that 12 cases of empty beer bottles downstairs in the shop. Even more shop towels!! Yep. I'm going to jail. Damn the lawn! This thread is really more appropriate to the pub area. Anyway, as far as I can tell, in a nutshell- the new "laws" are that if you are "suspected of being a terrorist" the Constitution no longer applies and you can be detained without warrant or charges indefinitely. I think this is why the Chicago police were able to act so shamefully. Better shave those beards homebrewers. It might land you in "detention" some day. I agree, euge. I'll move it later unless one of the the mods does it first. Kinda reminds me of a story about 15 years ago when the FBI were following homebrewers home after visiting Brew and Grow/Chicago Indoor Garden Supply b/c they suspected the homebrewers of buying grow lights for the funny stuff. Yes. IIRC they had a camera up on a light pole, too. I used to only pay in cash there specifically because of that. I guess I've been lucky enough to never experience the whole neighbor-sees-wort-chiller-and-calls-cops thing. cops used to stop by about once a month to check out my 600 watt metal halide that was growing my salad during the long vermont winters. They liked to claim they were checking on a complaint against the neighbors which was somewhat ironic because we were the only house within shouting distance of the neighbors and we never complained. cops used to stop by about once a month to check out my 600 watt metal halide that was growing my salad during the long vermont winters. I get that cops don't get to pick and choose which laws they enforce, though District Attorneys do have some say in which cases they choose to prosecute. In Denver, there were issues after the City of Denver legalized small amounts of pot, but the city's prosecutors still chose to prosecute city residents under state law, instead of punting to the state's attorney's to make them either deal with it, or ignore it. Even if you were growing pot, I'm sure you're not the scariest person in Vermont, and I'm also pretty sure those cops could've been doing something more productive with their time. I don't care for pot myself, but it's pretty low on my list of "menacing things" somewhere between butterflies and nervous dogs. You've obviously never been bitten by a butterfly.